Even the best brewers occasionally miss their target mash temperature. Whether its due to a calculation error, water temperatures being off or perhaps just a cold mash tun it eventually happens to us all. So today I’m going to cover what to do when your mash temperature comes in a little too high or a little too low. The vast majority of all grain home brewers use some type of infusion mash, where a calculated volume of water is heated to a fixed temperature and then added to the crushed grains so that the mixture hits a target mashing temperature usually in the 146-156F (64-69 C) range. You can calculate the amount and temperature of the water to add using software like BeerSmith or any of dozens of online calculators. 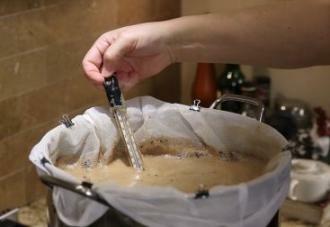 In most cases the mixture will hit within a degree or two of your target temperature, which is “good enough” for home brewing. Once in a while, however, things don’t work out as well. The reasons for missing your target temperature can be many. You may be slightly off on the temperature of the water going in, the mash tun may absorb more or less heat than you guessed, you may have your equipment profile off a bit, or the grains or mash tun may be colder or hotter than you anticipated. Whatever the reason, you now need to do something to get your mash temperature back on target. The way to get your mash temperature back on target is to simply add a small amount of hot or cold water to the mash. If you are below your target, you can prepare a bit of boiling water in a tea kettle and add small amounts until you get back to your target temperature. If you overshoot your mash temperature, you can add some cold water from the refrigerator or ice water to get back on track. If you want to be more precise there is a tool in BeerSmith called the Mash Adjust Tool (under the tools menu) which can calculate the exact amount of water to add given your current mash conditions and the temperature of the water you are adding. You can also calculate the amount of water to add using an online infusion step calculator (or the equivalent equation), as essentially that is what you are doing with the water addition – creating another step temperature (different from the current one) but adding a bit of hot or cold water. This is the same as using infusion water to create a second step in a multi-step mash. Another method for mash temperature adjustment is to directly apply heat if you are low on your temperature. Obviously in this case you need a mash tun that can be heated, but this method is also good if you are using Brew-in-a-bag or have a RIMS/HERMS system If you overshoot your temperature, you could even consider using your wort chiller or immersion chiller (the one you have for the end of the boil) to chill the mash a few degrees to get back on target. So these are some of my ideas for all grain brewers who miss their target temperature. Do you have an idea I missed? Leave a comment below! Thanks for joining me on the BeerSmith Home Brewing Blog. Be sure to sign up for my newsletter or my podcast (also on itunes…and youtube…and streaming radio station) for more great tips on homebrewing. Also check out the How to Brew Video series I shot with John Palmer if you want to learn more about all grain brewing. One thing I’ve always wondered is what kind of timeframe is required for these adjustments. I know it probably depends somewhat on the differential (e.g., 3 degrees off versus 15 degrees off target), but when is it “too late”? How much should I hurry? Am I OK if I adjust the temperature in 5 minutes? 10 minutes? When is the point of no return? Are there any data on this? as always, good advice! After quite a few brews where I couldn’t maintain the temp thru the whole mash period I now use my Fermentation heating pad if I’m concerned that it’s going to cool too much. Switching it on at the beginning of the mash seems to help it maintain temp with just a duvet wrapped around the circular chilly bin. Cheers! Excellent price but still out of my price range at the moment. If I didn’t already purchase a couple coolers, valves, chiller, boil pot & a false bottom, I would have purchased a grainfather.